Professor Thomas Bartscherer is on the research team at the École Normale Supérieure that has developed Nietzsche Source, the premiere internet site for access to the edited texts and original manuscripts of Friedrich Nietzsche. 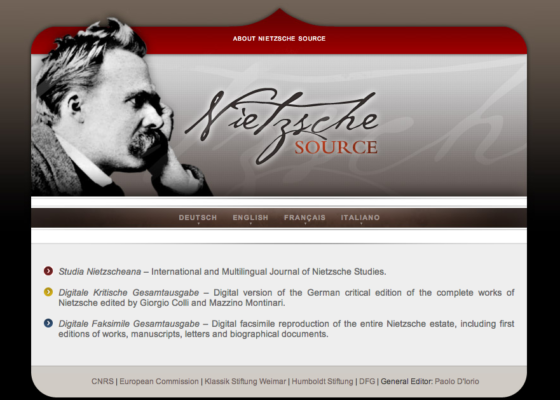 Nietzsche Source is a web site devoted to the publication of scholarship on the work and life of Friedrich Nietzsche. The site is open access and its stable internet addresses can be cited for scholarly purposes. The Équipe Nietzsche at Institut des Textes & Manuscrits Modernes promotes research on Nietzsche through conferences and scholarly publications and through the support and development of Nietzsche Source.